In 1958 a small group of families seeking a liberal religious education experience for their children founded our Fellowship. Ours was one of many Unitarian fellowships throughout the country that consultant Munroe Husbands helped to start through his work with the American Unitarian Association. During the early years meetings were lay-led and held in members’ homes. As one of the few liberal religious voices in the small Central Oregon town of Bend, the Fellowship grew rapidly, fueled by responses to the Vietnam War and the founding of the Central Oregon Community College (COCC), the first community college in Oregon. The combination of intellectual excitement and social activism of the 1960s was a powerful stimulus for the Fellowship’s growth. The congregation was able to purchase a small building, and growth continued until the Fellowship numbered about 50 members. A key event during this period was a clash between Fellowship members who were also faculty at the community college and the community college administration. The conflict reached a crisis after a public reading of Alan Ginsberg’s “Howl” and led to the dismissal of several COCC faculty who were UUFCO members. WOVEN BY MONA KIRK, an early member of UUFCO. After two decades of slow growth, the Fellowship’s membership began to decrease at the same time the lumber industry in Oregon was in decline. The church building became difficult to maintain and was eventually sold. By the late 1980s, when the Oregon economy was in a deep recession, membership had reached an all-time low of five active members. There was talk of UUFCO disbanding; however, one long-time member offered strong encouragement to stay the course. Money from the sale of the building was used to rent meeting space where the small group met twice a month, usually in a discussion group format. During this period UUFCO was “a church in a box,” with the congregation changing rental facilities every few years. UUFCO was an independent congregation with strong humanistic values but little connection to the larger Unitarian Universalist movement beyond paying our yearly UUA dues. During the 1990s the face of Bend began to change as more economic diversity, including high tech, service industries and tourism, revitalized the Central Oregon economy. Bend was also a rapidly growing destination for recreation and retirement. This was a period of slow growth and rebuilding at UUFCO. Families joined the congregation and initiated a religious education program for their children and youth. Retirees from Unitarian Universalist congregations around the country brought their talents, vision, and leadership to UUFCO. During this period the Fellowship paid local speakers and occasional UU ministers from the Willamette Valley to contribute to Sunday services. Our reconnection with the Unitarian Universalist Association and the Pacific Northwest District began in 2003 when discussions began at board meetings about hiring a minister. A part-time church administrator was hired and more liturgical elements were added to Sunday services. UU ministers who visited us from larger western Oregon congregations played a larger role in Sunday services. Discussion Sundays, which occurred once a month and involved lay-led discussions of short articles on spiritual and ethical topics, were an important part of our monthly programs. By 2004, UUFCO had grown to 60 members. Although finances were tight, the time was right to hire our first consulting minister. Rev. Jeanne Pupke was hired on a quarter-time basis in August of 2004 and moved to one-third time in 2005. Her hiring had a dramatic impact on the Fellowship. She brought continuity to Sunday services, an emphasis on attracting and nurturing new members, and attention to pastoral care. Membership grew by 50 percent—to 94 members—during this two-year period. The Fellowship leased a larger church building (the Old Stone Church), hired a part-time Religious Education Director, started a choir, and worked to strengthen committees and programs. In 2006 Rev. Pupke accepted a full-time position as the minister of the First Unitarian Universalist Church of Richmond, VA and we welcomed Rev. Heather Rion Starr as our part-time minister. We celebrated Rev. Heather’s ordination in 2007 and she offered energy and enthusiasm as we grew from a family-size to a pastoral-size congregation of 130 members by 2012. During this period the congregation called Rev. Heather as our full-time settled minister. 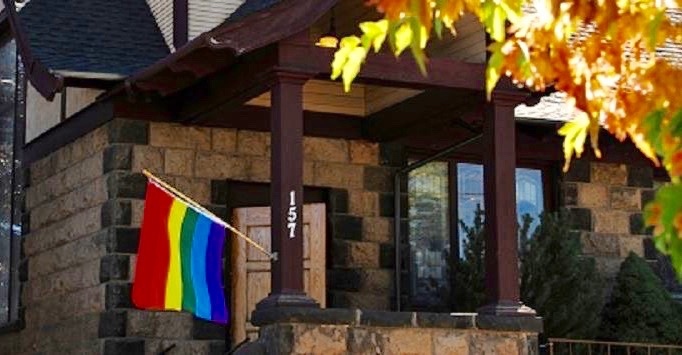 We reaffirmed our commitment as a Welcoming Congregation, developed active pastoral care and adult religious education programs, added summer Sunday services to our church calendar, and strengthened our interfaith commitment and community outreach, including support for the Bethlehem Inn, a local homeless shelter, and commitment of monthly Greater Community Collection offerings to organizations doing work aligned with our UU Principles. Social activities such as Circle Suppers, book and writing groups, men’s and women’s spirituality groups, and year-round outdoor adventures deepened the connections in the Fellowship. We celebrated our 50th anniversary in 2008 with an oral history project and Readers’ Theater presentation of our history that honored our founders and early members. By 2010 our membership had increased to 115 and it was clear that UUFCO was outgrowing the Old Stone Church, a historic building with a beautiful sanctuary but limited availability for our increasing activities, no office space, and inadequate facilities for religious education programs. Conversations began about buying a building of our own and the search began. After pursuing several possibilities, in late 2011 UUFCO received an extraordinary gift from an anonymous donor family of land and funds that allowed us to envision building our own church. The congregation launched a New Home Project that included a capital campaign to raise contributing funds and we began planning for our new home. In July 2012 Rev. Heather resigned her position to move to Washington D.C. and devote time and energy to her new family. Rev. Alex Holt joined us as our Interim Minister in August 2012, helping us prepare for the challenges of occupying our new home while also maintaining the health and vitality of our congregation. During Rev. Alex’s ministry we started small ministry/covenant groups, adopted a relational covenant, and began restructuring our organization to meet the needs of building ownership. We completed a successful capital campaign and broke ground for building our new home in September 2013. By the end of Rev. Alex’s interim ministry with us in July 2014, UUFCO had more than 160 members. The congregation was deeply involved in many aspects of the New Home planning, from initial visioning and sustainability workshops to participation in small task-oriented workgroups for planning of specific areas of the building and outdoor environment. The Design Committee, Steering Committee, and Board ably guided all aspects of the project and the Advanced Planning Task Force made organizational recommendations for managing our new building and anticipating future growth. Rev. Antonia Won joined us as Developmental Minister in August 2014 to help guide us through the move into our new home and respond to the resulting growth in our membership and programs. Because of her Canadian citizenship, Rev. Antonia’s move to Bend was delayed by eight months until she was granted a work visa. During that time she ministered to the congregation remotely and visited as often as she could. We held the first service in our almost-completed new home on February 1, 2015, and dedicated the completed building on April 26, 2016. UUA President Peter Morales, past ministers Rev. Jeanne Pupke and Rev. Heather Rion Starr, Rev. Antonia Won, and other UU ministers and UUA and PNWD staff shared the joyous occasion with us. Our building is an inviting and sacred space that embodies the principles of Unitarian Universalism and the spirit and values of our congregation. We see it as a resource for our present congregation, the greater community, and generations to come. In keeping with the UU principle of “respect for the interdependent web of all existence of which we are a part,” sustainability was a guiding principle for the design, construction, and operation of our building. We are the first church in the world to attain Platinum Certification under the Earth Advantage Commercial Program. Our building and land meet and exceed the requirements in five Earth Advantage categories: energy, water, health, materials, and land. With Rev. Antonia’s guidance we created a Sunday Volunteer Team program to involve more people in supporting our Sunday services and began a Soul Matters ministry organized around a monthly theme that we explore both in worship services and small group discussions. Rev. Antonia initiated a Leadership Development Committee and a Program Council to address long-term leadership needs and establish better communication and coherence among the ministries of the congregation. The Board of Trustees is engaged in implementing a governance by policy model.. Attendance at our Sunday services and membership have continued to grow since the move to our new building. New members and friends continue to infuse the congregation with fresh ideas and energy, and more families with young children are joining us all the time. In recognition of our dynamic growth, UUA recognized UUFCO as a Breakthrough Congregation in 2016. Our congregation is committed to warmly welcoming newcomers and helping them find meaningful connections and ways of being of service. Many community organizations use our facility for meetings, workshops, conferences, fundraisers, and performances. Rev. Antonia's last service with us was June 25, 2017. Rev. Scott Rudolph, became our new Settled Minister on August 15, 2017. We welcome Rev. Rudolph's creative energy, experience, collaborative leadership, and spiritual guidance as we work together to realize our mission of seeking meaning, celebrating life, and serving the spirit of love and justice in our world.